Russian winged orbital launch vehicle. This Soviet equivalent to the US X-30 single-stage-to-orbit scramjet aerospaceplane began development in1986. Three versions were planned: a Mach 6 test vehicle, under construction at cancellation of the program in 1992; a Mach 6 intercontinental bomber; and a single-stage-to-orbit launch vehicle. Status: Cancelled 1992. Thrust: 900.00 kN (202,320 lbf). Gross mass: 90,000 kg (198,000 lb). Height: 72.00 m (236.00 ft). Diameter: 13.00 m (42.00 ft). In reaction to US X-30 project, government decrees of 27 January and 19 July 1986 ordered development of a Soviet equivalent. The Ministry of Defense issued technical specifications on 1 September for an MVKS, a single-stage reusable aerospaceplane system. The MKVS was to provide effective and economic delivery to near-earth orbit; develop the technology for effective transatmospheric flight; provide super high-speed intercontinental transport, and fulfill military objectives in and from space. It is known that the Tupolev, Yakovlev, and Energia design bureaus submitted designs. Tupolev seems to have received the development go-ahead. The Tu-2000A was to be an experimental design to test the many advanced technologies required. It would have been 55 to 60 m long, have a 14 m wingspan, and a takeoff mass of 70 to 90 metric tons. It would have only been capable of Mach 6. Before work was stopped in 1992, some development work was completed: a wing torque box of nickel alloy had been built, as well as fuselage elements, cryogenic fuel tanks, and composite fuel lines. The Tu-2000A would have used a variable cycle turboramjet engine using methane or hydrogen fuel. The Tu-2000A was to have been followed by two production designs, as Tupolev felt no single design could meet all of the military requirements. The Tu-2000B would have been a 10,000 km range bomber with a crew of two. 350 metric tons at takeoff, 200 metric tons empty, it would have been 100 m long, with a wing of 40.7 m span and 1250 square meters area. Six liquid hydrogen powered engines would take the bomber to Mach 6 cruise speed at 30,000 m altitude. 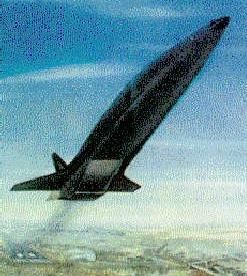 The Tu-2000 space launcher would have weighted 260 metric tons at lift-off and be capable of Mach 25 (orbital velocity). An 8 to 10 metric ton payload would have been delivered to a 200 km orbit. As with the X-30, airbreathing flight to orbit seemed questionable. The 8 turboramjets would have to be supplemented by a scramjet or a rocket engine in order to achieve orbit. Stage 1. 1 x Tu-2000. Gross Mass: 90,000 kg (198,000 lb). Empty Mass: 40,000 kg (88,000 lb). Thrust (vac): 882.000 kN (198,281 lbf). Isp: 1,550 sec. Burn time: 860 sec. Isp(sl): 1,550 sec. Diameter: 13.00 m (42.00 ft). Span: 14.00 m (45.00 ft). Length: 60.00 m (196.00 ft). Propellants: Air/Slush LH2. No Engines: 1. Engine: Scramjet. Other designations: EAP - Experimental Aerospace Plane. Status: Study 1993. Aerospaceplane to compete with American X-30. Single stage to orbit, scramjet air breather. Tupolev assigned to start work in 1993. Mockup built, and some subscale flights to Mach 6 on tactical missiles of scramjet model, but project now dormant due to lack of funds. Wing area 160 square meters, wing sweep 70 degrees. Two crew. Family: orbital launch vehicle, Space station orbit, Spaceplane, Winged. Country: Russia. Engines: Scramjet. Launch Vehicles: Tu-2000. Propellants: Air/Lox/LH2. Stages: Tu-2000 EAP. Agency: Tupolev bureau. Bibliography: 301, 83, 89, 8739. 1986 - . LV Family: VKS series. Launch Vehicle: Tu-2000. In reaction to US X-30 project, development of a Soviet equivalent decreed. - . Nation: Russia. In reaction to US X-30 project, government decrees of 27 January and 19 July 1986 ordered development of a Soviet equivalent. The Ministry of Defence issued technical specifications on 1 September..
1986 January 27 - . LV Family: MVKS. Launch Vehicle: Tu-2000, Yakovlev MVKS. Government decree orders design of a Soviet aerospaceplane - . Nation: Russia. Spacecraft: Tu-2000, VKS, Yakovlev MVKS. In reaction to US X-30 project government decree ordered development of a Soviet equivalent..
1986 March 30 - . LV Family: VKS series. Launch Vehicle: Tu-2000. Tupolev starts developement of aerospace plane - . Nation: Russia. Class: Manned. Type: Manned spaceplane. In reaction to US X-30 project, Tupolev OKB asked to start work on counterpart. By 1992 mockup completed, but solving of propulsion and inlet problems intractable without access to supercomputers..
1986 July 19 - . LV Family: MVKS. Launch Vehicle: Tu-2000, Yakovlev MVKS. Government decree orders development of a Soviet aerospaceplane - . Nation: Russia. Spacecraft: Tu-2000, VKS, Yakovlev MVKS. The decree of 27 January 1986 was reaffirmed..
1986 September - . LV Family: MVKS. Launch Vehicle: Tu-2000, Yakovlev MVKS. MVKS specification issued - . Nation: Russia. Spacecraft: Tu-2000, VKS, Yakovlev MVKS. The Ministry of Defence issued technical specifications on 1 September for an MVKS, a single-stage reusable aerospaceplane system. The MKVS was to provide effective and economic delivery to near-earth orbit; develop the technology for effective transatmospheric flight; provide super high-speed intercontinental transport, and fulfil military objectives in and from space.